Posted by jonathanwarren in Consulate of Monaco, Las Vegas, Las Vegas Consular Corps, Uncategorized. Madame Leigh-Hunt was the last surviving of three daughters of Huntridge and Las Vegas Strip developer Henry Leigh Hunt and famed French author Louise de Vilmorin. “Alexandra Leigh-Hunt died peacefully in her sleep on December 2, 2015 in her home in Sag Harbor. Noted in equal measures for her elegance, the warmth of her hospitality and the conviction of her opinions, she was 85 years old and in failing health. Having won the Prince Pierre of Monaco Literary Award in 1955, Alexandra’s mother, Louise de Vilmorin, was invited to cover the 1956 wedding of TTSSHH Prince Rainier III and Princess Grace, in Monaco for Marie Claire Magazine. She had recommended her former husband, globe trotting adventurer and Las Vegas property magnate Henry Leigh Hunt, to be Honorary Consul of Monaco in Las Vegas. He had been appointed by Rainer III and confirmed by President Dwight Eisenhower in January, 1956, becoming the first Consul of Monaco and thereby opening the first consulate ever in Nevada. Alexandra was also the granddaughter of International empire builder Leigh S. J. Hunt, who first envisioned the Las Vegas Strip and attracted its first investors. Consul Jonathan Warren was fortunate to have had the opportunity to have interviewed Ms. Leigh-Hunt, by her generous invitation in August of 2013, in Sag Harbor New York. The interview provided critical information and photos which will be published in an article in Las Vegas this spring. A book will follow. We at the Consulate were saddened to hear of the passing of Alexandra Leigh-Hunt. Our condolences to the many family and friends mourning her loss and remembering her long and interesting life. Posted by jonathanwarren in Consul of Monaco, Consulate of Monaco, Las Vegas, Las Vegas Consular Corps, Nevada Consular Corps, Prince Rainier III of Monaco, Principality of Monaco. The following is an exerpt from the obituary of Henry Leigh Hunt, Honorary Consul of Monaco in Las Vegas from 1956 to 1963. It is believed to have been written the end of December, 1972. Henry Leigh Hunt, 86, who died Thursday at the American Hospital in Neuilly was a descendant of both John Adams and Daniel Boone. During his long and adventurous life, he showed many of the characteristics of each. Born in Des Moines, Iowa, he became a blood brother of the last monarch of China, hunted for many months with a renegade Assiniboine tribe in Canada, lived on a cotton plantation in the Sudan, captained the Yale polo team, was a mucker in a mine in Colorado, surveyed the Alaskan wilderness, learned gunfighting from the sheriff of El Paso, built a railroad in Brazil, was decorated by the French and American armies for his bravery in Belleau Wood, worked as a banker in Paris and as a real estate operator in Las Vegas. The love of his life was the beautiful French poetess Louise de Vilmorin. Although their marriage ended in divorce, they remained close and in 1962 he returned to France to be near her. He spent his last years at Saint-Lambert-des-Bois near Paris, and it is there, in the graveyard of the little church he loved, that he will be buried at 11 AM Tuesday. He is survived by his sister, Mrs. Bayard Rives, and by his daughters, Jessie Wood, Alexandra Horsey and Helena Baxter, and by his twelve grandchildren. Although the above obituary (provided by his descendants) was likely submitted to newspapers in New York and Las Vegas, it does not appear either ever printed it. Given the exceptionally low profile and spectacular life of Henry Leigh Hunt, some speculate that the papers simply thought it too fantastic to believe. Posted by bjpayne2003 in Aspen Consular Corps, Consul of Monaco, Consulate of Monaco, Grace Kelly, Las Vegas, Las Vegas Consular Corps, Monaco Royal Wedding, Nevada Consular Corps, Prince Albert II of Monaco, Prince Rainier III of Monaco, Princess Caroline of Monaco, Princess Charlene of Monaco, Princess Grace of Monaco, Principality of Monaco. April 19th is certainly one of the most auspicious dates in the history of Monaco. For it was on that date in 1956 that the small Principality became the center of the world’s attention and, essentially, a household word. The fairytale romance between Grace Kelly and Prince Rainier III became a reality for the world as the two were married in Monaco’s cathedral. Covering the story for Marie Claire, contemporary author Louise de Vilmorin put it succinctly when she summed up the world’s fascination for a “queen of Hollywood” giving up her throne to become a Princess. A resident of Las Vegas from 1925 until 1931, Louise de Vilmorin was one of the preeminent French novelists of the day. Her famed novel “Madame de-” had just a few years prior been adapted into an acclaimed film. Having been awarded Monaco’s Prince Pierre Literary Award, named in honor of Prince Rainier’s father one year earlier, She was a highly appropriate choice to pen an article on the wedding of Prince Rainier and Princess Grace. Back in the US, Louise’s former husband, globe-trotting Las Vegas land baron Henry Leigh Hunt, had just been confirmed as Honorary Consul of The Principality of Monaco in Las Vegas (the very post held by Consul Warren) in January of 1956. In honor of this anniversary, a look back at some of the photos from the event and a new summarized translation of Louise de Vilmorin’s report, published under the title of “I Was There at the Wedding” has been prepared below. Princes are always effective, but when they are on a throne, they are very effective. Me, for the moment, I’m sitting on a chair in a room of the house called “Santo Sospir” in Saint-Jean-Cap-Ferrat. The walls of this room are blank pages on which Jean Cocteau would easily trace drawings. Just now, when I rise, my seat will be empty. This is what differentiates us from reigning princes and kings who can swim, drive or fly, while still on the throne. They are at the same time mobile and immobile. Privileges intrigue the imagination more than the gifts and we recognize the approval such privileges can win. A young girl marries an artist without becoming an artist, she marries a prince, she becomes a princess. Fairy tales show the possible as you know, you who read newspapers. Newspapers in recent weeks, are quivering to the point that it is a penalty to read them. You sit, you hold them, mail them, but tremble so hard that you shake like the train. Tell me, sir, what is the wind that shakes the leaves? Well, it is the wind of Monte Carlo…yes, be sure today that it is the wind of Monte Carlo that ruffles the leaves of the world. The onshore wind, the wind of love on a rock, a storm bringing with it the creation of a household. It has been anticipated by automobiles, diamonds and lace. Among designers, by small hands and itchy fingers: the academicians and their embroidery, the gentlemen of the order of Malta held their red paint and put the cross around their neck, high and noble, ladies, billionaires and snobs feel a reason to dress up and be cakes. They control the pistachio, the mint, the raspberry and they braid their hair with violets of Toulouse, pure sugar. Their shoes are coffee éclairs and their handbags are melting candy. Their husbands, themselves, dress in licorice, whipped cream, and all this is due to the movement of a star. Astronomers do not sleep and the prophets of metro announce the lovely scene. In short, we prepare, we watch, we listen. What a story! Prince Rainier III of Monaco loves a queen of Hollywood and it is love. The event is important. Will she resign? Will she give up her throne? Despise her supremacy, ending her reign and becoming a princess when she was queen? Well, yes she will. She heard a voice, and presto! Her Majesty Grace Kelly was transformed to a Serene Highness. She has left scores of Americans, she waved and followed the voice of the heart. She is a blonde, Grace, slender and graceful, accompanied by a black poodle, surrounded by her parents and sixty courtiers. She navigates a crossing of the Ocean, and tackles the shores of the Principality of Monaco. Suddenly, there was cannon fire. The echo was heard in a Timbuktu, leaves agitated me more and more, so I boarded the train.In the corridors, it is the same as in the dining car, travelers are gazing and talking: You’re to be at the wedding? I’m going. No, I am not going, I am going down to Toulon. If you looked at my feet, you would see that I am going … The foot does not disappoint. I have bought new shoes. The city of Monte Carlo is all decorated with flags of Monaco – half red, half white and American flags. The hotels are crowded. It’s raining softly and there are no taxis. All vehicles are requisitioned or locked up. Some carriages, drawn by two horses in macramé bonnets, roll in the city and the Americans walk while breathing the air of another time. It is perhaps by inventing the past they believe they are transported to the time of Grand Dukes. One hundred elected officials avoid, or embrace, or nudge in the lobby of the Hotel de Paris. This is the domain of winks and what will be said? We talk about the civil marriage which took place in the morning. It is said that Grace Kelly was not smiling and that the prince was silent, we are awaiting the gala performance at the Opera tonight. Grace, who will be entitled to be called Serene Highness after the religious marriage will be throughout the day of 18th be known as “Madame Grimaldi”, and it is Madame Grimaldi that will appear in the princely box lovely, but fleeting. All eyes were fixed on the little face of tomorrow’s princess, on her sparkling dress and on her blond hair crowned with a diadem of rubies and diamonds, and the serious face of Prince Rainier. And then, barely have we seen them as they disappear into a trap. A moment of anguish … What has happened? The room is very beautiful and bears the weight of tradition, we feel that most of the people who are here say, “Since I’m here, I’m surely someone”. This is a reassuring thought. As for the theater stage, it will be from one end to the other a show enchanted by Margot Fonteyn, Yvette Chauviré and Mademoiselle Toumanova. Prince Rainier III reigns, you know, over vast horizons. However, in recent days, he is very worried. Through the windows of his palace, at the top of the Rock, he sees from one side the gray sea, and on the other side, umbrellas. This is not a sign of good weather and, like us, he wants a blue sky. What to do? Father Tucker, who apparently knows more than a good thing, advised him to offer a dozen candles to Saint Clare … As was said, so it was done: Blue skies, please Holy Lady … The sky lit up and the weather was beautiful when they came to wake me the morning of the wedding. I slept little: I was haggard and had puffy eyelids. We tend to laugh, but this is not funny. We are hiding under a lovely coat a white satin dress and large white straw hat. We must occupy promptly at 9:30am the seats which have been reserved in the cathedral. On the square in front of the church, there is a triple row of soldiers: French, American and English. The music is French and there is a crowd of gentlemen in licorice suits, crossed with grand ribbons encrusted with sparkling stones, and a crowd of ladies, most of whom, as we know, have made their clothes from pastry. Those who are afraid of melting ice. That’s understandable, and they will quickly take shelter in the sacred cool, while those in plum pudding cake and have the advantage of being able to relax on the porch. Jean Cocteau watched it all from the top of a balcony overlooking the square. It is actually quite a story. It is claimed he is offended, but this is not true. He had composed in honor of Rainier an ode that the prince was to have heard the previous evening at the Opera. Confusion would hinder this project but without hurting the author of the poem. The “fluff”, it is there in the Cathedral. We look, comparing the places, but the music silenced whispers. The preparation of the choir. Suddenly, after a silence, the music resumes, intensifies and rises, and the bride appears in the arms of her father. They move very slowly, they walk a walk not unknown, yet one would say that they are preserved in emotion. Grace wears a real dress, that is, a dress without a date, a dress that is not fashionable, but is timeless; and the frail bride with her pallor of ivory and white tulle, and lace, the altar is illuminated with flowers, as to an aurora borealis of Enchantment. There’s no procession. The Princess, the witnesses, as the parents of Grace, one by one, followed by their honor service. Preceded by his Chamberlain, accompanied by his bodyguards, Prince Rainier, in a grand uniform, appears last. There the downcast eyes, he almost seems to suffer and we feel a sense of what awaits him, solitary and kneeling in the distant light of the Church. The Church: the moment of the question and the response, the vows, the oath. The spirit changes the mood. It is emotion; you can feel the heart beat and all thoughts are more than a bunch of fervor. The vision of love makes the heart serious. I know and, while the couple exchanged their rings, they receive Holy Communion, nostalgia showed me happiness and I begged God to protect love. Need I say more? I talked more. I laugh more. I became aware of all the efforts made for the intimate event that became a great party and should remain a beautiful memory deserving of a halo. A respect came to me and I felt remorse. When the couple left the church, I loved when they showed themselves to the crowd of their little people. I was happy to hear them cheering. – Where are the newlyweds …? Where are the newlyweds?… they said. – Allow them time to breathe..
“The time to breathe” appeared along with everyone and it was just the time that I envied. What time! What breath! What happiness! And it really is in happiness that they both appeared atop a white marble staircase. They finally smiled down the steps. Smiles stopped at a sugar cake two meters tall and weighing ninety pounds, placed in the shade of the stairs. A cake monument stood in a niche of rare plants, orchids and other exotic wedding flowers, while doves cooed in a wicker cage. The doves flew. The lovers, too, are gone. They sail their happiness between sky and water, and when they return to Monaco, the Prince will reign over a state that is already a state of Grace. Posted by jonathanwarren in Consul of Monaco, Consulate of Monaco, Las Vegas, Las Vegas Consular Corps, Mayor Goodman, Monegasques in the USA, Prince Albert II of Monaco, Principality of Monaco, Uncategorized. The Sovereign Prince of Monaco lent his influence to the cause of potable water and sanitation development Friday night. 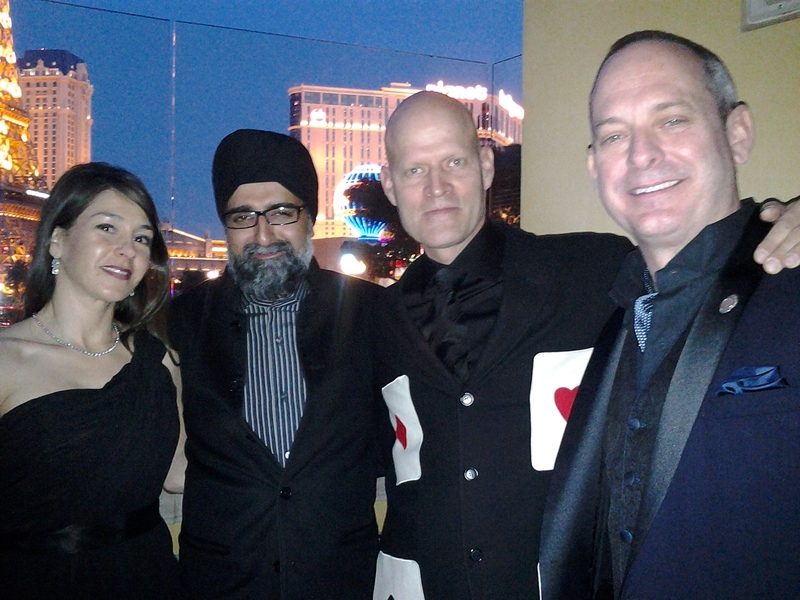 When Cirque du Soleil co-founder Guy Laliberté asked HSH Prince Albert II of Monaco to be the Honorary Chairman of the One Night for One Drop event at the Bellagio in Las Vegas, the Prince quickly agreed. Consul Warren joined other attendees at the VIP cocktail reception at Hyde at Bellagio in viewing a special video greeting from His Serene Highness. The participation of the Prince is more that simply a kind gesture for a friend. The Prince Albert II of Monaco Foundation maintains water issues as a primary area of focus. Mr. Laliberté and Prince Albert II have worked together on the matter much. One Night for One drop was a tremendous success. The event drew thousands. Many not only attended the show, but also the VIP Cocktail Reception at Hyde at Ballagio, and the after-party which ran until 1:00 a.m. There the pool was covered with a transparent floor and tented, housing a luxurious venue for musical acts, sumptuous culinary delights and libations. Posted by bjpayne2003 in Consul of Monaco, Consulate of Monaco, Grace Kelly, Las Vegas, Las Vegas Consular Corps, Monaco Royal Wedding, Monegasques in the USA, Prince Albert II of Monaco, Prince Rainier III of Monaco, Princess Grace of Monaco, Principality of Monaco. With wide ranging options for first-class entertainment, dining and shopping it sometimes can be easy to forget the historical side of a visit to Monaco. While the most visible link to the past, the Prince’s Palace, is a must-stop on any itinerary, this site along with a few landmarks on le Rocher may be all the casual visitor gets to see of Monaco’s history. If your historical interest runs a bit deeper, you may be curious to hear a bit about a less well known but very tangible link to Monaco’s past – the history of the Principality’s early coinage.You may not suspect a nation of Monaco’s size to have such a numismatic legacy, however Monaco’s early Princes were eager to assert the independence of the Principality and a key part of this was the right to mint their own coinage. Not coincidentally, the first Prince, Honoré II, was also the first to begin minting in Monaco in 1640. With just one significant break in the period from 1735-1837, Monaco has continued to issue a varied and rich series of coins into the modern era. For anyone intrigued by this part of Monaco’s history, a weekend in December 2012 provided something of a treat. Three major events over two days allowed a rare glimpse at Monaco’s past. The centerpiece of the schedule was a very special exhibition celebrating the 500th anniversary of the wide recognition of Monaco’s independence. Featuring items loaned from the Palace Archives as well as several European museums, visitors were granted the opportunity to view items that are rarely, if ever, on view. These included correspondence of Monaco’s early rulers (the title Prince first being used in 1612), as well as the 1512 decree from France’s Louis XII recognizing the independence and sovereignty of Monaco. The exhibition was hosted at the Musée des Monnaies et Timbres (The Coin and Stamp Museum), a small but exquisite museum tucked away in Monaco’s Fontvieille district. Though the exhibition provided an added bonus, a visit here anytime is fascinating; the Princely Collection housed here is unrivaled in the world. On Saturday, December 1st, the well known Monaco firm of Éditions V. Gadoury (www.gadoury.com) organized a superb auction of rare coins from ancient to modern times. A highlight of the sale was a collection of rare early Monaco pieces, one of the largest such collections to come to auction in a century. From the earliest coins of the Honoré II through the centuries to the likeness of the iconic Princess Grace, the collection was a history of the Principality in miniature. All of Monaco’s early coinage is scarce and most of the denominations and years are extremely rare; the auction featured several coins of which 2 or fewer examples were known to exist. Rounding out the events was the annual Monaco coin fair on Sunday, December 2nd. Dealers from around Europe saw brisk sales in all areas of coin collecting. Additionally, postcards, early photographs and paper items were to be found. Happily, this event is now on annual basis and will be held again in 2013 in conjunction with another auction by Éditions V. Gadoury. The auction is scheduled for Saturday, November 30th with the coin fair to follow on Sunday, December 1st. Posted by jonathanwarren in Consul of Monaco, Consulate of Monaco, Fete Nationale, Las Vegas, Las Vegas Consular Corps, Monaco National Day, Nevada Consular Corps, Prince Albert II of Monaco, Princess Caroline of Monaco, Princess Charlene of Monaco, Princess Grace of Monaco. The Principality of Monaco hosted the FICAC World Congress of Consuls November 11-13, 2012. The Monaco National Day celebrations took place the following week. Consul Warren and others remained in Monaco for both sets of events. Hosted by the Honorary Consular Corps of Monaco, the World Federation of Consuls produced its tenth triennial World Congress of Consuls with great success on the 30th anniversary of the institution, in Monte Carlo, Principality of Monaco. Nearly 300 delegates from all over the world attended the event. After the events of the World Congress, consul Warren and others enjoyed a three-day rest before beginning the Fête Nationale de Monaco (the Monaco National Day) celebrations. 2012 represents the 3rd National Day celebrations attended by Consul Warren, who was once again accompanied by the Honorable Paulina Biggs Sparkuhl, Honorary Consul of Chile in Las Vegas. In addition to the traditional cocktail at the Palace followed by the dinner at the Beef Bar with the Consular Corps of Monaco, the fireworks and mass the following day were followed up by a surprise for visiting Americans. By request of HSH Prince Albert II, the flag ship of the sixth fleet of the US Navy, the USS Mount Whitney, was docked at the Port d’Hercule in Monaco for the National Day celebrations. His Serene Highness had requested the strong American presence to commemorate the passing of his mother, HSH Princess Grace of Monaco. His Excellency Charles Rivkin, US Ambassador to France and Monaco arranged for the presence of the Ship in Monaco. The USS Mount Whitney’s officers and crew hosted a spectacular lunch on board the vessel. His Excellency Gilles Noghés, Ambassador of Monaco to the USA, attended, leading the Consular Corps of Monaco in the United States. His Serene Highness Prince Albert II was welcomed by the Commander and the Ambassadors, as was Her Royal Highness Princess Caroline, escorted by her two sons, Andrea and Pierre Casiraghi, both of whom are officers in the Prince’s Guard. Posted by bjpayne2003 in Consul of Monaco, Consulate of Monaco, Las Vegas, Las Vegas Consular Corps, Monegasques in the USA, Principality of Monaco. A recent trip to Monaco afforded the opportunity to hunt for historic finds in and around the Principality. And indeed, an interesting piece was discovered – one that we thought we would share with friends of the Honorary Consulate in Las Vegas. At just over 2 ft. square and just shy of 200 lbs, this cast iron crest features the Principality’s coat-of-arms. You may notice some subtle differences however, as this is a slightly earlier form and one most common prior to the 19th century. The piece is believed to have come from a collection in Menton, so it may originate from the area east of the current borders of the Principality. You may recall that prior to 1848 both Menton and Roquebrune were part of Monaco’s lands and the Principality was, consequently, significantly larger than what we know today – see the c. 1840 map below. This type of cast iron plate was sometimes used as a ‘fireback’, set into the back of large chimneys in order to help radiate heat out into a room. This may indeed be what this piece is, but unfortunately we don’t have any idea where it came from. Another possibility is simply an architectural ornament, set into a gate or wall – it does show signs of having been exposed to the elements for at least some period of time. As we continue to research the original context, we welcome the insight of anyone who may recognize the piece or one like it. Posted by jonathanwarren in Consul of Monaco, Consulate of Monaco, Las Vegas, Las Vegas Consular Corps, Monegasques in the USA, Nevada Consular Corps, Principality of Monaco. H.E. Ambassador Gilles Noghès, Deputy Chief of Mission Lorenzo Ravano, Casino Monte Carlo Director Patrice Solamito, Casino Monte Carlo Public Relations officer Michel Marchese, and Monaco Director of Conventions and Tourism Guillaume Rose were among the dignitaries hosted at the Consular Residence for a cocktail with supporters of the Consulate, on the evening of June 15th in Las Vegas. The evening was hosted by Jonathan Warren, Honorary Consul of Monaco in Las Vegas, Consul Paulina Biggs Sparkuhl, Honorary Consul of Chile in Las Vegas and Baroness J. Kathleen von Schaefer, Chief of Protocol for the Consulate of Monaco in Las Vegas, at the Consular Residence. Local supporters of the Consulate, as well as members of the Nevada Consular Corps enjoyed an evening of cocktails and celebration after a series of successful meetings and events in Las Vegas. Other attending members of the Consular Corps included Consul Terry Murphy (Ireland), Consul Aner Iglesias (El Salvador), Consul Lena Walther (Sweden) and Consul General Gary Furlong (Uzbekistan). Supporters of the Consulate present included Official Archivist of the Consulate Bradley Payne and Mrs. Payne; Opera stars Marco Verela and Betsy Ann Fiore; music director Mark Wherry and Mrs. Elena Wherry, Cultural Advisor Surya Bonaly, financial advisor Felix Danciu of Elmcore Group, and of course the Chief of Protocol Baroness J. Kathleen von Schaefer. Support for the evening and all of the previous events also came from Tuxedo Junction, Haberdasher and Sartorial Advisor to the Consulate and from Earth Limos, Official Transportation Provider for the Consulate of Monaco in Las Vegas. Las Vegas community leader Steve Schorr was instrumental in arranging much of the Consulate events over three days. Other local friends and dignitaries included the incoming President of the Nevada Public Health Association, Dr. Christina Madison. Col. Annette Whiteside, President of the Las Vegas World Affairs Council, joined the festivities. Las Vegas institutions and dear friends of the Consul, Count G. Robert Deiro and Countess Deiro also greeted the guests. Consuls representing six consulates of Monaco in the USA were also in attendance. The finale of the evening was when Ambassador Noghés and Counselor Lorenzo Ravano joined Las Vegas opera stars Marco Varela and Betsy Fiore to perform a performance of O Sole Mio. Posted by jonathanwarren in Consul of Monaco, Consulate of Monaco, Las Vegas, Las Vegas Consular Corps, Monegasques in the USA, Nevada Consular Corps. In 1955, famed Parisian author and former Las Vegan Louise de Vilmorin visited Monaco to receive a literary award from HSH Prince Rainier III. Three days later her husband, Henry Leigh Hunt of Las Vegas, was tapped to be the first Consul of the Principality of Monaco in Las Vegas. Hunt was the first consul of any foreign state based in Nevada. His appointment came at the end of a long and illustrious career. 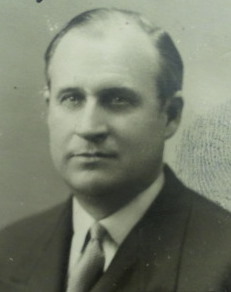 Consul Hunt retired in 1963. In 2006 His Excellency Gilles Noghès became the first Ambassador of Monaco accredited to the United States. Ambassador Noghès worked to increase consular representation of Monaco in the United States, including recommending the 2010 appointment of Consul Jonathan Warren in Las Vegas. The appointment returned the Consulate of Monaco to Las Vegas after a forty-seven year hiatus. On June 14th, 2012, the Consulate of Monaco in Las Vegas hosted the first meeting of the Consulates of Monaco to take place outside of Washington, D.C. Seven consulates joined the Ambassador Noghès and Deputy Chief of Mission Lorenzo Ravano at the Wynn Resort for their annual meeting. Participating consuls included Consul General Maguey Maccario (New York), Consul Thomas Horn (San Francisco), Consul Charles Battle (Atlanta), Consul Calvin Fayard (New Orleans), Consul, vice-Consul Tomas Abreu (Miami), vice-Consul Raffaella De Laurentiis (Los Angeles) and Consul Jonathan Warren from Las Vegas. Following the meeting, the consuls and Ambassador were joined by special guests for lunch in the Villa. In addition to consular meeting, the group was hosted by the Consulate of Monaco in Las Vegas to a behind-the-scenes tour of the Dolphin Habitat and Secret Garden of Siegfried and Roy, led by Siegfried and Roy themselves. Consul Warren hosted the group at a cocktail reception at the consular residence, as well as tours of the Smith Center and Springs Preserve before taking participants to Phantom the Las Vegas Spectacular, including a meeting of with cast members. Posted by jonathanwarren in Consul of Monaco, Consulate of Monaco, Grace Kelly, Las Vegas, Prince Albert II of Monaco, Prince Rainier III of Monaco, Princess Grace of Monaco, Principality of Monaco. Rare Tour by the ‘Masters of the Impossible’ themselves takes Monaco diplomats behind the scenes in rare animal habitat. Long before they ever came to Las Vegas, Siegfried and Roy made a Royal Command Performance for HSH Princess Grace of Monaco at the 1966 Red Cross Ball (Gala de Roi) at the Sporting House in Monte Carlo. During the performance, Chico, the Cheetah who starred with the duo, ran off stage and headed for the kitchen. The event was a big hit and garnered much press. Some say it was the big break for the magical duo. Two decades later, with unprecedented Las Vegas success accredited their show, they would return to the Principality and serve as judges for the Grand Prix of Magic in Monte Carlo. Friends of the Monaco Royal Family for a generation, Siegfried and Roy were the consummate hosts of the official representatives of the Principality during the first meeting of the Monaco US Consular Corps in Las Vegas. The group held its first meeting outside Washington, D.C, at the Wynn Resort in Las Vegas on June 14. The meeting also marked the first official visit of the Ambassador of Monaco to Las Vegas. The Consulate of Monaco in Las Vegas, with the help of a team of volunteers including Las Vegan Steve Schorr, arranged for H.E. Gilles Noghès, Ambassador of Monaco to the USA and Canda, and consuls from 6 districts in addition to the Las Vegas consulate, to meet with Siegfried and Roy and tour their Dolphin Habitat, Secret Garden and the behind-the-scenes lairs of the their legendary white tigers, white lions and other great cats. The group was astounded at the high quality of life, health and beauty of the great cats. Touring the garden with the narration that only Siegfried and Roy could give was a once-in-a-lifetime opportunity not lost on the audience of Monaco officials.